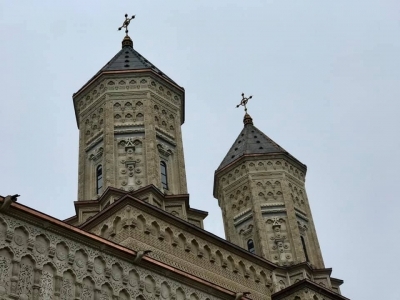 L'église des Trois Hierarques de Iassy is part of the Tentative list of Romania in order to qualify for inclusion in the World Heritage List. Visited December 2018. This church probably will never find its place on WH list; it is beautiful, unique, has its values, but it is enough? The church was built in the first half of the 17th century and is dedicated to three saints: Basil of Caesarea, Gregory Nazianzus and John Chrysostom. It was built in post-byzantine style and features a very rich exterior relief decoration in which you can find influences from all around the world that was known at that time: Turkish, Arab, Persian, Armenian, Georgian, Mauritanian symbols and signs incorporated in the typical Romanian church building. There are in total 30 stripes going horizontally around the whole building. The walls of the church are tick (around 1 m). The interior is pretty dark, full of paintings, but they are not original. Inside you can also see the tombs of A. Cuza and D. Kantemir, two men very important for the Romanian fight from Turks. The biggest problem with this church is that it was devastated many times in its history and was reconstructed/rebuilt in the second half of 19th century by Andre Lecomte de Nouy and his team, not according to its original design. Especially its interior lacks authenticity. The church is located in the centre of Iasy, open every day, and the entrance is free.